So, this survey might as well be a skipping record, I’m realizing. I feel like I kept repeating the same books! But you know what? I think that speaks to a couple of things: One, when I read a book I LOVED this year, I loved it HARD and for INFINITY TIMES FOREVER AND EVER. Two, not as many books blew my socks off this year as in years past, maybe. Or…it could just be that the books I loved the most blew me away SO MUCH that they put all other books to shame and make those books pale in comparison to their loveliness and beauty and awesomeness and OHMYGOD WHY ARE THERE NOT ENOUGH ADJECTIVES?! Ahem. So. Basically, you’re going to see lots of the same books over and over again here because there were a few that just touched my heart and I can’t ever get them out. 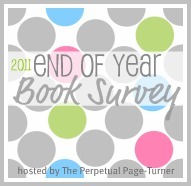 Also, there are a number of books on here that didn’t come out in 2011, but I read them this year. 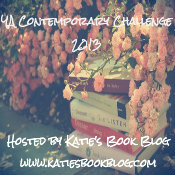 Genre: Urban Fantasy YA, Fairies! Summary: The year is 1871, and Tiki has been making a home for herself and her family of orphans in a deserted hideaway adjoining Charing Cross Station in central London. Their only means of survival is by picking pockets. One December night, Tiki steals a ring, and sets off a chain of events that could lead to all-out war with the Fey. 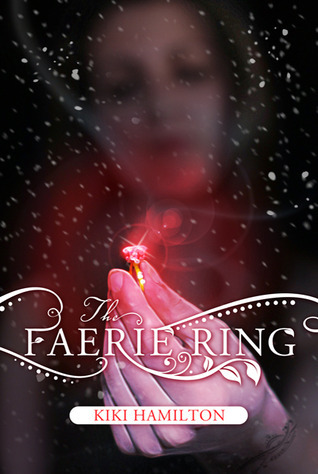 For the ring belongs to Queen Victoria, and it binds the rulers of England and the realm of Faerie to peace. With the ring missing, a rebel group of faeries hopes to break the treaty with dark magic and blood—Tiki’s blood. In the dark days since the insidious Red Lung virus decimated the human population, vampires have risen to rule the crumbling cities and suburbs. Uncontested Princes hold sway over diminished ranks of humans: their “pets.” In exchange for their labor, loyalty and of course, their blood, these pets are registered, given food and shelter, permitted to survive. Unregistered humans cling to fringes, scavenging for survival. Allison Sekemoto and her fellow Unregistereds are hunted, not only by vampires, but by rabids, the unholy result of Red Lung-infected vampires feeding on unwary humans. One night, Allie is attacked by a pack of rabids, saved by an unlikely hero…and turned vampire. Uncomfortable in her undead skin, Allie falls in with a ragtag crew of humans seeking a cure, or cures: for Rabidism and for Vampirism. She’s passing for human…for now. But the hunger is growing and will not be denied. Not for friendship—not even for love. It almost never happens anymore that I get excited about vampire books. In truth, I’ve read very few, but they’re kind of all over the place and I LOVE them, so I have a tendency to follow them wherever they lead: Twilight, The Vampire Diaries, True Blood. I get my fill of them, and because there are so many other great things to read, I feel like reading about vampires is not something that’s usually on the top of my to-read list. EXCEPT. Except that this new series, Blood of Eden, which is about vampires and all other kinds of juicy stuff, has sprung from the awesome mind of Julie Kagawa, author of the Iron Fey series. I will read ALL OF HER WORDS. And I’m intrigued by the premise: humans as a race have been decimated by illness and vampires have risen to rule and power, keeping the humans as blood slaves. Obviously there are rogue humans and a young girl turned against her will. DRAMA, Y’ALL. We can has it! Seriously, though, this book sounds and looks fab, and I just know that it’s going to be so great because Julia Kagawa is such an excellent weaver of stories. 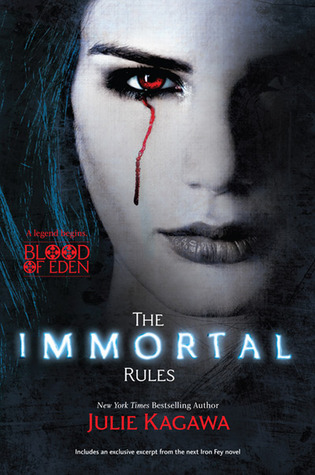 THE IMMORTAL RULES is coming out April 24, 2012 from Harlequin Teen. 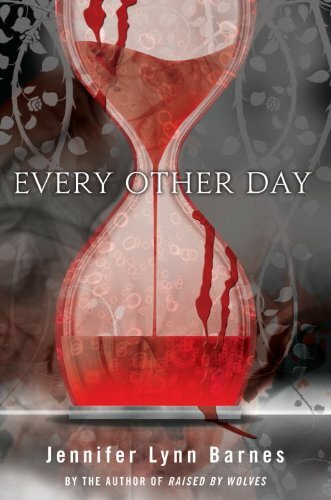 Summary: Every other day, Kali D’Angelo is a normal sixteen-year-old girl. She goes to public high school. She attends pep rallies. She’s human. And then every day in between . . .She’s something else entirely. When Kali notices a mark on the lower back of a popular girl at school, she knows instantly that the girl is marked for death by one of these creatures. Kali has twenty-four hours to save her and, unfortunately, she’ll have to do it as a human. With the help of a few new friends, Kali takes a risk that her human body might not survive. . .and learns the secrets of her mysterious condition in the process.